Families are what you make of them. 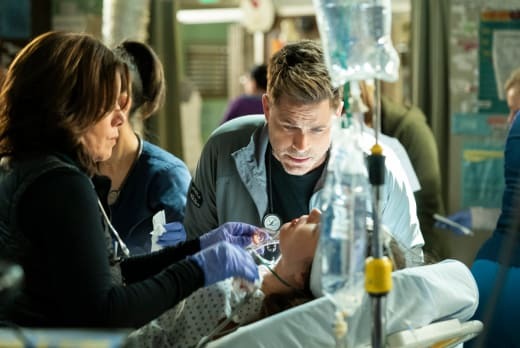 They're not always what you expect -- Code Black Season 3 Episode 11 shows us that repeatedly. Brother's aren't brothers because of DNA, but because of common bonds and shared values. Family is obviously central to the concept of Code Black. This isn't news. Hell, two of the characters refer to themselves as Mama and Daddy. But as we close in on the end of the series season, it's starting to feel like there's an urgency to prove this thesis. Angus' possible daddy-hood is only one instance of this. Too bad this story got all kinds of effed up. Mario's interference was both atrocious and benevolent, Will's advice was total crap and hypocritical to boot, and you can't tell me that Yvonne isn't playing Angus for all she's worth. Mario did overstep by looking into Angus' records but considering Angus was also treating this child, how in the name of all that is holy did he not pick up on the blood type incongruity? That's something from med school 101. While it's weirdly refreshing to hear Will tell his male resident the same bs that women are usually subjected to when it comes to a work-life balance, it doesn't make what he's saying any less dumb. All I could think was what if Emily had rolled in on that conversation? And I'm sorry, I don't care how endearing Dominic is, Angus owes that child and his mother absolutely nothing in terms of a long-term commitment. Yvonne is manipulative as all get out, and I can't believe I care this much when the end is nigh. Mario's overreaching interference might be the most frustrating aspect of this plot though, if only because his other important relationship is clearly headed towards disaster. He's going to need the support of his brother best friend pretty soon. It's really amazing to me that Mario and Noa are one of the few couples on television that actually communicate with one another and yet they're always having these massive misunderstandings. Maybe it's because they only talk about their issues while they're at work. If they really want to compartmentalize things, that's probably not a good idea. They're not the only ones that could stand to take that advice, of course. Rox and Ethan certainly made a mess of things by mixing up work with their burgeoning romance. But those lines can be hard to draw, especially when one of you is dealing with some enormous stressors, like, say, your father disowning you after finding out that your brother was responsible for the massacre of school children. And it's not like Ethan has ever suffered from an abundance of emotional intelligence. The shock of the hit & run and the emotional wringer that Ethan is put through after definitely work as a way to jolt him out of his stubbornness and stupidity. That doesn't mean I have to like it. The setup takes away almost all of Rox's agency in their relationship, which is even worse than casting her as the solution to all his problems. Somehow, her life being at risk is really all about him and his redemption. Having Emo back would have been better if she'd been there to read him the riot act for how he treated her girl. At the center of all of these stories, however, we do have a strong family. Leanne and Jesse are always there for each other, and should probably be offering a class on how to work with people you love when there are power dynamic issues. Leanne certainly went through a roller coaster of emotions from the high of finding out about Ariel's court date, the shock of her friend's accident, then helping those separated twins, to going home and finding her daughter missing. I'm exhausted just thinking about all that. Not to mention that said adoption is probably in question since she lost her kid. I don't think the court is going to look kindly on that. Leanne going out to rip the cop who arrested Mama a new one was a great moment...on the surface. The scene was the first time I can remember this show doing a "ripped from the headlines" story, and I'm sorry to say that they didn't do that great of a job. I needed more from this than a single scene. The abuse of power and violation of civil rights deserved more commentary than Jesse being arrested and immediately released because he guilted the lady cop. Especially because this story has been done by other medical dramas before. Chicago Med, it pains me to say, actually did this better on Chicago Med Season 1 Episode 12. Not to mention, because they did it all, and usually did it best, ER. Related: NBC Sets Fall Premiere Dates -- When Do Your Favorites Return? As crazy (and inspiring) as all the Leanne moments were, the one that stood out the most to me was her comment to Will that all the cases are personal. It wasn't really profound, and far from the most emotionally insightful thing she's said. 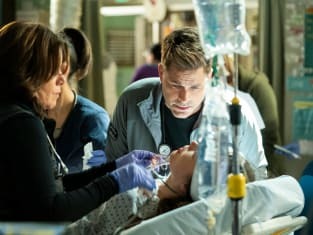 But it was in direct contrast to Rox's comments to Ethan before their big blowout, a comment that was repeated during his flashbacks after she was injured. Saying that all cases are personal seems to be in direct opposition to her admonishment that you shouldn't work out your own issues through your patients. Which are we supposed to believe? The long lost twins bit was so far-fetched and crazy but I LOVED it. The scene with the shots alternating between the two brothers was amazing. Brilliant writing, brilliant editing. Did I miss the requisite Rob Thomas music at the end? Or was it just really forgettable? I feel cheated. Still no Penny. Piper? Pepper? Petra? I don't even care about her at this point, but it bothers me that she just disappeared! We want to hear your take on "One of Our Own." Will Ethan be able to save Rox? Will Mario and Angus be able to salvage their friendship or have they drifted too far apart? How is Leanne going to find Ariel? Share your thoughts in the comments section below! And don't forget, you can watch Code Black online with us anytime!